Perfect for gardening! The garden scoot has a little caddy to hold your tools and supplies. The pneumatic wheels make rolling over light terrain and grass a breeze. The scoot will hold 300 pounds. 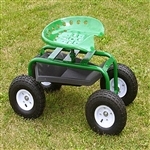 Comfortable tractor styled seat on this rolling garden seat make gardening chores easier without bending!